Outreach International is looking for a long-term volunteer with good research and writing skills to work in Haiti for 6-12 months. If you are interested in helping Outreach International’s school system in Haiti, which serves over 9000 students, recover from the January earthquake, click here to read the vacancy announcement. In response to the terrible earthquake in Haiti, both Outreach International (click here for their appeal) and the church (click here for their appeal) are calling on church members to give generously to those in need. I’m just back from a week in Independence. 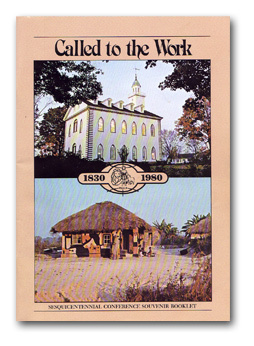 One of the things I picked up there was an old 1980 souvenir booklet from the sesquicentennial of the church (bought from the Temple Library for 25¢). As we’re approaching another sesquicentennial — the first was 150 years since the organization of the church, next year is 150 years since its reorganization — I was eager to see how the last one was commemorated.